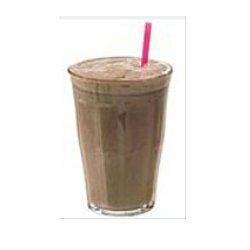 The best extra calorie weight gain smoothie (or shake) is not one with ‘loads and loads of calories’ but one with the right amount of extra calories. A really high calorie smoothie might sound great, but most people struggle to drink them more than once a day (if that) and very often give up after a few days. 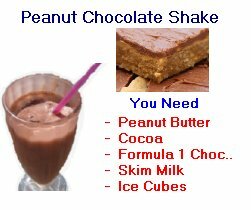 Which is why the extra calorie weight gain shakes (and smoothies) below are designed to be enjoyable, without putting a strain on your digestive system. 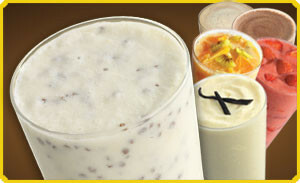 The basic extra calorie weight gain smoothie (or shake) is very easy to make (only takes a few minutes). 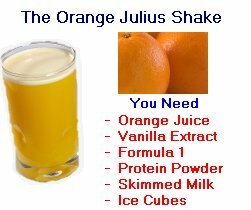 Be very careful when you buy a powder (weight gain shake mix, etc.) in a supermarket or specialist shop because many simply won’t work, if you are using the wrong powder. For example tubs (often containing pictures of bodybuilders) with ‘muscle building / protein powder’ might only work if you go to the gym, and won’t help you if you simply want to ‘look a bit less skinny’. The key is to use exactly the right type of powder to fit in with your own individual objectives – why not let us email you a recommendation ? 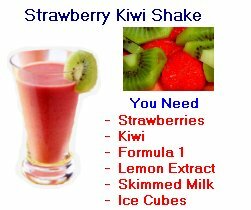 Ideal for Extra Calories + boosting absorption. To make simply put in a blender until smooth. Very easy and quick to make – great for extra Breakfast Calories. 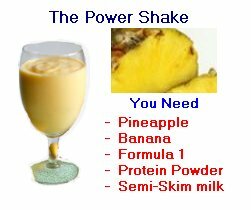 This potassium-rich shake is perfect for boosting absorption & extra calories..
To Make place all ingredients in the blender and mix thoroughly until the ice cubes are completely crushed. 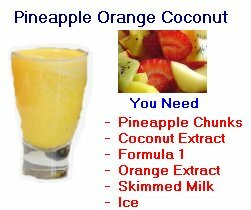 Place all ingredients in the blender and blend until the ice cubes are completely crushed. Great taste, oodles of calories and easy to make. Just put in a blender until smooth. if you just ‘crave’ a sweet taste ! Because it’s not all about calories but also about ‘absorption’. The vitamins are great to help absorption ! 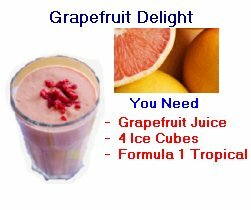 To make place all ingredients in the blender and blend thoroughly until the ice cubes are completely crushed.